Everytime pass by Sekinchan Ikan Bakar Restaurant there are so many people waiting both inside and outdoor. I guess that's what draw my attention to pay a visit and try out their dishes. It is nearby Gorgeous Fitness. There wasn't much people that day but definitely got customer waiting for their ikan bakar already. There are so many choices including Ikan kembung, Ikan Yam, Ikan Cencaru, Ikan Pari, Ikan Siakap, Kerang, Lala and many more. 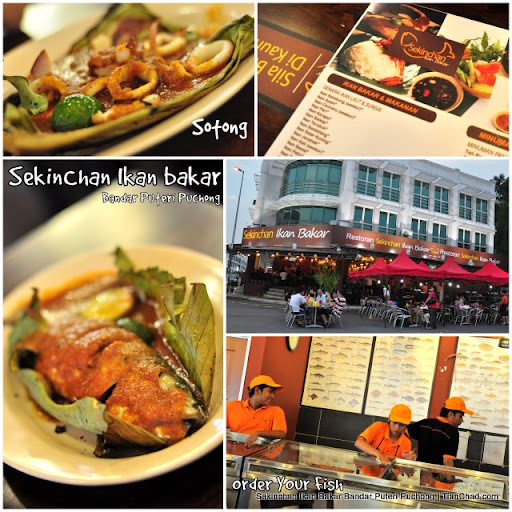 You are advised to go with your friends to book a table then only go for their self-service to order your Ikan Bakar. I ordered Ikan Kembung, Ikan Pari (already cut), and a sotong as our dinner. This is the sotong. I think RM10.oo for this plate. Make sure you choose the biggest sotong because they count roughly base on size =.="
Must order Ikan Kembung because without it your visit will not be perfect. We've waited for at least 20minutes before manage to gobble. Luckily they have TV to broadcast interesting channels. The fishes are fresh but the same sauces was used in three dishes that I've ordered. Not sure if can switch the sauce. Maybe that's why they don't taste much different. Or maybe because I didn't dip with their belacan/chili sauces? Total bill including drinks for two is RM50++. What do you think about it? I consider it expensive especially the mini size nasi lemak. Sekinchan Ikan Bakar is having a promotion when you spend at least Rm100/resit you can participate their 42" LCD TV Giveaway Contest. They have set lunch (RM10-RM17) and happy hour (3-6PM 10% discount total bill) too . Call 012-2476489 or email to tempahan@sekinchanikanbakar.com for booking.